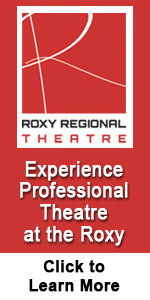 A Doll’s House: One of the Roxy’s best! Henrik Ibsen’s A Doll’s House, first performed more than a century ago to scandalized British audiences and once the target of censorship, seems tame by 21st century standards, but there’s nothing tame about this Roxy Theatre production and the power exuded by its cast. As the scene is set in Act One, we are introduced the somewhat stodgy and condescending Torval Helmer (Matthew Archambault), a bank manager who treats his wife, Nora (Nikki Ferry), as if she were a child, a mental featherweight he teasingly refers to as his “sparrow” and”little squirrel” and other similar endearments. And indeed, in this elegant Victorian setting, Nora emerges initially as a sometimes pouting, childish, seemingly flighty bit of fluff all to happy to spend a day shopping, fluttering through a fairly superficial life and trying to be both secretive and clever about the sweets — the macaroons — she treats herself to behind her husband’s back. It’s all a game, or so it seems, but then the plot — as it always does — thickens. The cast of A Doll’s House: top from left, Matthew Archambault as Torvald, Joe Sonsenshein as Krogstad, Linda Speir as Nanny; bottom from left, Nikki Ferry as Nora, Elyse Chambers as Mrs. Christine LindeAnne and Jay Doolittle as Doctor Rank.